It's Day 5 of our holiday recipe spectacular, and we've got some delicious dessert recipes from Brenda Langton, author of The Spoonriver Cookbook (where the following recipes come from) and The Cafe Brenda Cookbook. Enjoy! Day 4: Hearty, vegan-friendly entrees with Jenny Breen. Day 3: Corn chowder with Atina Diffley. Day 2: Swedish pancakes with Helene Henderson. Day 1: Sweet potato walnut salad and snack cake with Beth Dooley. 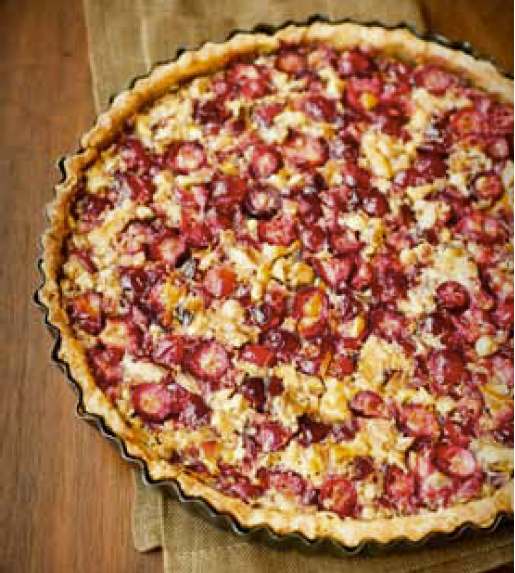 This is a festive tart to serve for the holidays, but it is certainly welcome all fall and winter long. You can use fresh or frozen cranberries. There is no need to thaw frozen cranberries, and they are easier to chop when frozen. This is a very simple tart to make. 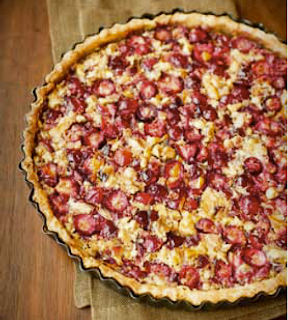 If you have a tart shell already prepared, you can throw it together in just a few minutes. Combine the eggs, honey, butter, orange juice, vanilla, and salt. Beat with a whisk until the mixture is smooth. Stir in the cranberries, walnuts, and orange zest. Pour the filling into the prepared tart shell. Bake in the center of the oven for 40 to 45 minutes or until golden. Place the tart on a wire rack to cool. Let it cool completely before serving. Makes enough dough to line an 8- or 9-inch tart pan. Combine the flour and salt in a bowl. Cut the butter into small pieces and drop them into the flour. Work the butter into the flour with a pastry blender or two knives until the mixture resembles coarse meal. In a small bowl, lightly beat the egg. Add 1 tablespoon of ice water and stir to combine. Slowly pour the egg mixture into the flour mixture while stirring with a fork. The mixture should be moist but not wet and should hold together in a ball. If the mixture seems too dry, add more water a little at a time until the dough comes together. Gather the dough into a ball. Flatten it into a disk and wrap it in plastic wrap. Refrigerate for 20 to 30 minutes. Flour a work surface. Roll out the dough, starting from the center and moving toward the edges. Turn the dough and flour it as you go to prevent it from sticking. Roll until the tart dough is 1⁄8 inch thick. Carefully lay the dough in the tart pan. Trim the excess dough, leaving about an inch beyond the edge of the pan. Fold in the extra dough and press it against the sides to double the thickness of the sides. Chill the tart shell for at least one hour before prebaking or filling it. more minutes to dry the bottom crust. To bake a shell completely, follow the above steps but bake it for 20 minutes before removing the weights. Return the shell to the oven for an additional 5 minutes. The crust should be a light golden brown. Kanten is a traditional Asian fruit dessert. It is like a refreshing, creamy fruit pudding. Top it with nuts and fresh fruit. You can vary the juice used to make many different flavors. Apple juice with almond butter is a good combination, and pineapple-coconut juice with sliced oranges is very refreshing. Kanten is pretty served in goblets, and using goblets makes it easy to layer two different flavors. Pour the apple juice into a saucepan. Add the agar flakes and the salt and bring the juice to a boil. Reduce the heat and simmer for 3 minutes, stirring frequently, until the agar dissolves. Pour the mixture into a bowl and refrigerate the kanten until it sets, approximately 1 1/2 to 2 hours. Using a blender, blend the kanten with the tahini until it is smooth and creamy. If necessary, blend in batches. Tahini varies in thickness. If you have very thick tahini, you may need to add a little more juice to get a smooth creamy texture. Pour the kanten into individual serving dishes. Serve the kanten cold. It's pretty served in stemmed glasses. 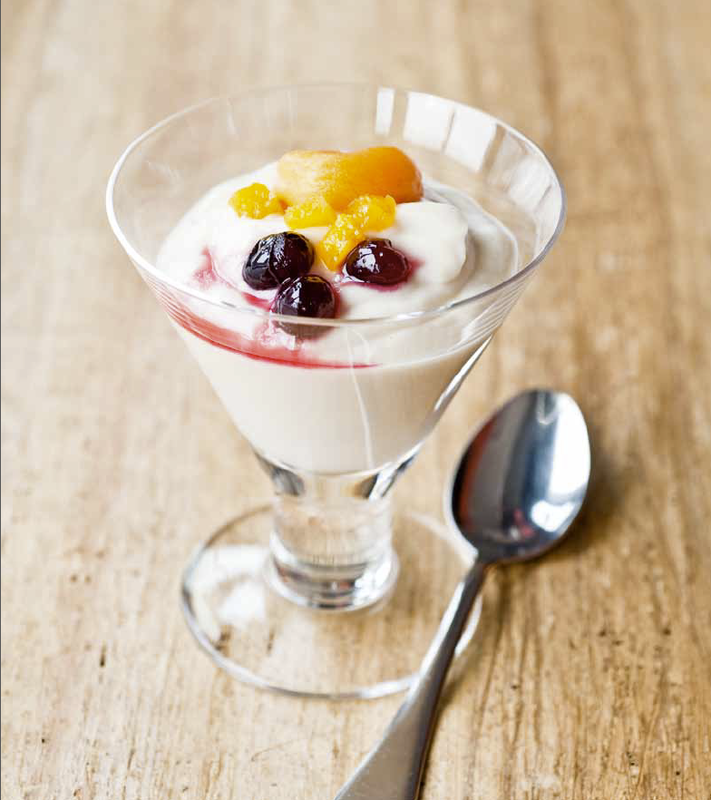 Garnish it with fresh fruit: try berries, grapes, kiwi, or citrus. Variations: Use apple-peach or apple-cherry juice and substitute almond butter for the tahini. Use coconut milk in place of the tahini. 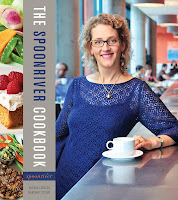 She is author of The Spoonriver Cookbook and The Cafe Brenda Cookbook: Seafood and Vegetarian Cuisine.